Bank on Buffalo - Niagara Falls Community Branch — BHNT Architects, P.C. There is a new bank in town it is growing again! BHNT/LaBella is delighted to be a part of the development team, bringing Bank on Buffalo to life in the WNY area! Bank on Buffalo, a division of CNB Bank, is currently operating a full-service branch and corporate offices within the Electric Tower in downtown Buffalo. BHNT/Labella is working with Bank on Buffalo to open an additional branch office in Niagara Falls to supplement their other two branches in Williamsville and Orchard Park, New York. 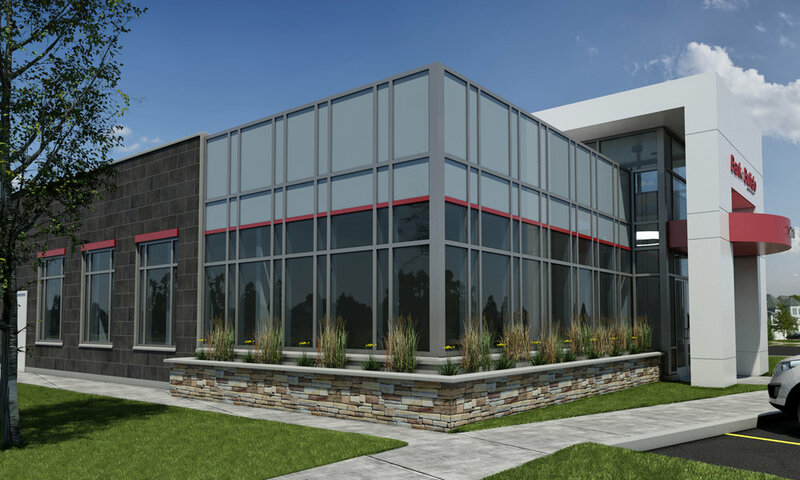 The Niagara Falls Community Branch Bank will be a ground up facility incorporating the Bank on Buffalo branding with the introduction of new, exciting and elegant exterior finishes. The interior concept is contemporary and stylish, supporting the new, more open, user friendly banking paradigm. The new branch is expected to be fully operational by Fall 2019. © 2019 BHNT Architects, P.C. All right reserved.